Scott Robinson's Doc Savage Suite "Bronze Nemesis"
The multi-instrumentalist Scott Robinson is a first call musician for many of today’s finest and most contemporary of big band ensembles. He has graced the reed section of Maria Schneider’s Orchestra as well as played in the ranks of the Mingus Big Band and as a member of Mel Lewis’s Village Vanguard Orchestra to name just a few. As a noted collector of rare musical instruments, Scott has made it his mission to preserve these most specialized of artifacts. He has actively learned the intricacies of playing many of these unusual instruments which include the C melody saxophone and the enormous contrabass saxophone, all in an effort to preserve their use in modern music. 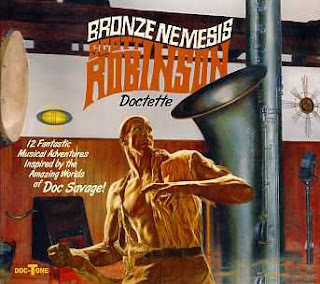 On his latest, most unusual, project Bronze Nemisis, Robinson uses his fertile imagination and the pulp fiction character of Doc Savage as his source of musical inspiration. A masterful musical adventure, Robinson’s spot on use of an arsenal of sounds from his vast array of instrumentation and gadgetry makes, the recording a theatrical and musical triumph. Joined in following Robinson’s muse are the pianist Ted Rosenthal, the trumpeter Randy Sandke, the bassist Pat O’Leary, and the drummer Dennis Mackrel. The “Man of Bronze” starts out ominously enough with thunderous rolling toms and a front line of tenor and trumpet. The large looming presence of the Man of Bronze, arch enemy of evil, is portrayed by Robinson’s clever use of ascending lines using the deeply resonant sounds of his euphonium and bass saxophone and topped off by a bowed bass cadenza by O’Leary that drips with tense anticipation as to what is next. Robinson's multi-reed facility is essential as he employs the woody tones of the bass clarinet intermingled with Sandke’s trumpet to introduce the next tune. “The Secret in the Sky” is at first a homage to the soundtracks of detective stories from another era, then Robinson’s science fiction brain takes over with his eerie use of the modulating, voice-like sound of the Moog theremin, complimented by little bell noises and some electric harpsichord. He creates this strange unsettling scene; you find yourself facing the unknown, then, suddenly, you are given a brief respite from danger as a more familiar, inviting rhumba-influenced break in the music lures you into a momentary sense of tranquility, only to return to the sounds of lurking treachery that hangs over you like some unsettling cloak of darkness. On the ominous sounding “He Could Stop the World” Mackrel’s shimmering cymbals sets the stage as Sandke’s trumpet and Robinson’s overdubbed bass and tenor saxophones climb a wall of intensity, a suitably dramatic entrance for the crazed evil genius that emerges from his secret place in the sky, declaring “If necessary I can stop the world on its axis!’. Meanwhile back at Doc Savage’s secret “Fortress of Solitude” the fictional hero is pondering his next move. This icy Arctic retreat of Savage’s was later absconded by Superman in the nineteen fifties. The group coolly grooves on this number with a nice jaggedly, obtuse piano solo by Ted Rosenthal and a menacing bass saxophone solo by Robinson that really swings. 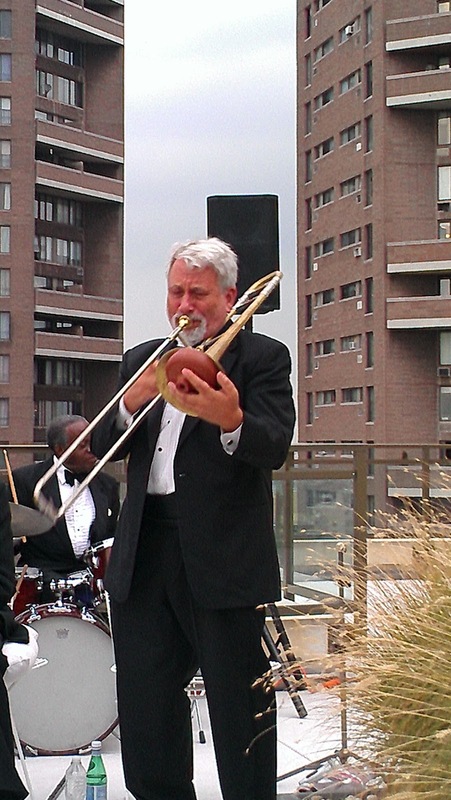 Robinson handles this large horn without lumbering; instead he floats lightly above the hip groove created by O’Leary, Rosenthal and Mackrel. “Mad Eyes” is a playful creation that would make a great soundtrack for a Halloween movie. Robinson’s simultaneous use of the slide saxophone and the Moog theremin creating the eeriest of sounds. A gravelly Sandke shows he too can make his horn emit a series of shivering voice-like utterances. Coupled with the groups moaning this one can that can make you feel like you are truly going mad. “The Metal Master” is another of Savage’s arch enemies, a mad scientist who has discovered the ability to destroy the molecular integrity of any metal. Leading off appropriately with a Chinese gong and some scraping metal noises, this piece includes a sawtoothed line played by Sandke on trumpet and Robinson on tenor. The tune uses contrapuntal lines between the two horns to lead us on this circuitous path. Robinson’s tenor voice is boisterous and brash as he navigates the chicane. Sandke’s trumpet is raucous as he climbs on crescendos of notes in the high register with an easy fluidity. The piece ends with a cacophony of clanging tubes, chimes and singing metal plates. The late Denis Irwin, the original bassist for Scott’s Doctette, is featured on a unaccompanied bass solo from “The Mental Wizard” recorded at a concert from 2001 and is here labeled “The Golden Man.” Sadly Irwin died two nights before the band went into the studio to record this album. The “Land of Always Night” is the most moving piece on the album. Rosenthal and Robinson play a wonderful duet that has a poignant quality with classical grace and soulful sonority. Scott’s sound is pensive and pure, with a breathless, whistling cadenza. The song was taken from his “Lagomorphic Concertino" and was written for his wife Sharon. He should play flute more often. “The Living Fire” is a musical representation of the living flame within and it sears with Mackrel’s sizzling cymbals, Sandke’s searing trumpet and Scott’s scorching tenor. Too hot to handle. “The Man Who Shook the Earth” opens with the earth-trembling sounds of the large treme terra, a refrigerator sized drum from Brazil. Robinson uses a wind machine and his own rare contrabass saxophone to create the deep rumbling feel to this musical collage. After a brief flurry from drummer Mackrel, we are treated to the mind boggling swing of Robinson’s gigantic contrabass. With some brief references to Monk’s “Well You Needn’t” hidden in the deep, blustery low register of Robinson’s solo, it is a rare treat to hear this instrument played with such confident swagger. The evocative “Weird Valley” features another of Robinson’s rare instruments, in this case the mezzo-soprano saxophone. The snake charming-like sound of this instrument has an air of the exotic and is mildly intoxicating, especially when complimented by the muted trumpet of Sandke. Pianist Ted Rosenthal is given some room to create his own special corridor in this weird valley and he does so with surprise. The two horns joined by the Moog Vanguard theremin raise their level of intensity at the rising coda as they intertwine their sinuous sounds like two mating cobras in ecstatic bliss. The final piece of this theatrical suite is “The Mental Wizard” a difficult composition, with no repeating parts and a testament to the groups seasoned interplay. Bronze Nemisis is a thoroughly enjoyable recording for anyone who wants to transport themselves into another, less complicated world of science fiction and mystery. Emblazoned with authentic Doc Savage images from original illustrator James Bama and packaged with extensive notes on the recording process and instrumentation by Mr. Robinson, this is surely one of the most creative musical offerings of the year. Scott Robinson, various saxophones, clarinets, flutes, euphonium, Moog theremin, wind machine, bells, chimes and various instruments/gadgets; Ted Rosenthal, piano and electronic harpsichord; Randy Sandke, trumpet and euphonium; Pat O’Leary,bass; Dennis Mackrel, drums, tubes and treme terra, Dennis Irwin , bass on track 7. 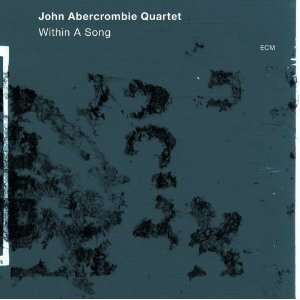 Exploring Influences: John Abercrombie's "Within a Song"
I first saw the guitarist John Abercrombie many years ago as with the super group Dreams. Even then he gravitated toward playing with people who challenged the norm, people like drummer Billy Cobham, the trumpet and saxophone duo, the Brecker Brothers and bassist Will Lee, As a fledgling guitar player myself , I took a keen interest in his development, a guitar player’s guitar player. His debut album as a leader came in 1974, with his presciently titled fusion album Timeless, this time with keyboard wizard Jan Hammer and drumming phenon Jack DeJohnette. Clearly Abercrombie was developing as a master musician who was following his own muse. His then avant-garde work with his group Circle, with drummer DeJohnette and bassist Dave Holland, was on the forefront of progressive jazz in the nineteen seventies. All along the way, this restless soul continued his quest to challenge convention, collaborating with the very best of his generation, often times with musicians slightly outside the mainstream including the multi-reedist John Surman, the pianist Richie Bierach, the eclectic trumpeter Kenny Wheller and fellow guitarist Ralph Towner. 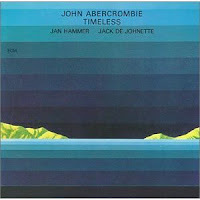 Abercrombie’s musical adventure has crossed into a myriad of musical styles with the one common thread running through all of them being the unique sound of John’s guitar. Musically you might never know what to expect next from John, but even blindfolded, as the drummer Billy Drummond recently said in Downbeat, you will always know who is playing from the first note because of John’s signature sound. Abercrombie’s latest ECM recording, Within A Song, features a series of songs that have been influential to guitarist’s development. For this outing John has again surrounded himself with some of the finest musicians currently working today, Joe Lovano on tenor saxophone, Drew Gress on double bass and Joey Baron on drums. The opening, “Where Are You,“ first came to the guitarist’s attention when he heard Sonny Rollin’s seminal album The Bridge from 1962. Guitarists often find their voice in listening to the work of other instrumentalists, not necessarily always other guitarists, but clearly hearing Jim Hall’s guitar became an epiphany of sorts to the young Abercrombie. John and tenorist Lovano take on the roles of Hall and Rollins from the original album, approaching the tune with the same moving sensitivity. Abercrombie pays homage to Hall’s lush, liquid sound here. Delicate comps follow Lovano’s lead. Lovano’s tenor is rich and warm with almost Getzian inflections. Joe is a master of precise intonation, even when playing cascades of notes adagietto. Drummer Baron’s shimmering cymbal work sets a dreamy scene evocative of Ben Riley’s work on the original. The song lingers in your memory long after it ends. “Easy Reader” is an slow Abercrombie waltz and according to the notes is somehow influenced by the picture “Easy Rider.” With Lovano and Abrercrombie stating a series of descending lines followed by a series of rapidly ascending lines in tandem, the song has a formal almost classical sensibility. The guitarist is given ample room to develop his rambling harmonic explorations with bassist Drew Gress reading his twists and turns telepathically. Lovano’s tenor soars softly with Abercrombie’s muted guitar comping and countering in a contrapuntal conversation. Baron’s rolling toms accentuate his flawless cymbal work toward the coda. The title song of the album is a take off of another song from Rollin’s The Bridge , “Without a Song.” On this album it is penned by Abercrombie as “Within a Song/Without a Song,” it is the most swinging song of the album. Gress’s plucky bass is buoyant and vascular, keeping the pulse invigorating. Baron keeps the most impeccable of time on his ride cymbal spicing the music with occasional timely rolls and well placed bombs. The song features a marvelous dual front line of Abercrombie and Lovano first stating the melody line in precise tandem and then in a stuttered call and response. Lovano is pure elegance on his horn. With an unflappable sense of time, Lovano navigates the chicane with a grace that is marvelously inventive. Abercrombie’s guitar meanders around the melody searching, probing the harmonic edges without going too far astray. After almost seven minutes the group touches on the last few bars of the original song, bringing it all back to place where it came from..
For many of us, the Miles Davis album Kind of Blue was an inescapable influence. Abercrombie chooses a deeply ruminative take on “Flamenco Sketches” from that album. He seems at his finest when he is left some room to be able to explore the depths of a song, uncovering new possibilities in succinct flurries, like short detours from a road well traveled. All the while the atmosphere of the song is retained and in some ways enhanced by the military-like drum cadence. The deep plucky bass of Gress is a tip of the hat to Paul Chambers fine work on the original. Lovano’s saxophone is amazingly versatile with a collection of flutters, moans, slurs and squeals all perfectly controlled and purposefully employed. The group excels at this marvelous homage to the original. “Nick of Time” is a jagged melody of John’s that is a reminiscent of the exploratory jazz of the sixties and seventies, when musicians were into testing the boundaries of the musical form. The musicians all navigate through the maze in with like-minded determination, maintaining a tonal quality and suppleness that is not obviously reliant on the melodic form but nonetheless creates a coherent musical statement. “Blues Connotation” is from the Ornette Coleman songbook. Originally recorded by the alto saxophonist on his This Is Our Music. This free form jaunt loosely plays with the blues form in a playful and open way. Lovano’s slightly screechy sound plays into the Coleman legacy. John’s guitar solo is suitably wandering. Joey Baron’s drum solo is light, loose and jagged in keeping with the unfettered Billy Higgins approach to Ornette’s music. The most moving song on the album is from John Coltrane’s 1964 release Crescent, titled “Wise One”. Abercrombie makes a beautiful entrance with his signature, tightly sequenced guitar voicing. Mr. Lovano’s exquisitely plaintive sound, while Coltrane-esque, is clearly of one of his own making, yearning and bordering on religious in its reverence. John’s comp work is the most Hall-like on the album. His solo is a tour de force of sensitivity and inventiveness as he demonstrates his unique sense of harmony. Baron’s rolling toms are subtly omnipresent and his dynamics are always tasteful. Gress’s is subtly grounding but never overpowering. Lovano returns to solo in his own inimitably tasteful way, cascading notes in cadenzas of seemingly endless ideas. Multi tonal ideas that follow their own unpredictable path but always leading to a logical conclusion. For anyone growing up in John’s era, pianist Bill Evans was an inevitable influence. Here John choose’s the minor blues “Interplay” from the 1962 Evans/Hall collaboration of the same name. Bassist Drew Gress gets to do a beautiful walking blues line that sets the tone. Lovano and Abercrombie show that they are no stranger to tasty improvisations over blues changes no matter how abstract the blues form is buried in the song.. The closing song was a favorite of Abercrombie’s from his days of watching the Art Farmer-Jim Hall Quartet titled “Sometime Ago.” Abercrombie starts with an obliquely rambling introductory solo before going into the memorable melody head on. Lovano brings his own sense of warmth to the song with a floating, poignantly played solo. He has a wonderful way of entering a song with smooth but forceful presence that commands you attention. When Abercrombie returns he climbs the tune with an ascending solo line that dances around the melody. Baron accents the guitarist’s turns with prescient changes of his own as the tune winds down we are treated to a beautifully controlled microtonal embellishment by the master saxophonist to end this poignant but uplifting piece. With some of tenor saxophonist Joe Lovano’s most emotional playing to date and ensemble work of the highest order, John Abercrombie’s Within A Song is a strong addition to the guitarist’s discography, once again validating John’s ability to continue to create timely music of extraordinary beauty. 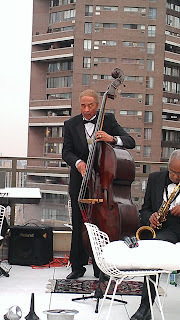 This past Thursday September 27, 2012, I was invited to attend a roof top party at one of Harlem's most prestigious new buildings One Museum Mile. Located at 1280 Fifth Avenue, this large, luxury apartment building occupies the corner between 109th street and Tito Puente Way( 110th Street), and the edge of Central Park North, right off the Duke Ellington Circle. In keeping with the jazz history of the area, there is Robert Graham's imposing, twenty-five foot tall bronze sculpture of Duke Ellington and his piano perched atop nine caryatids, adorning a small park within the circle. The recently opened Museum of African Art, with its sixteen thousand square feet of exhibit space, calls the ground level of this ninety thousand square foot building home. On this balmy evening, the view from atop the penthouse was spectacular. Despite the large cumulus clouds that lingered above threatening the outdoor proceedings with the possibility of showers, the evening was unscathed by any rain. The mostly gentrified crowd of invitees was treated to good food, drink, a soft sales pitch (the luxury apartments are for sale with presently 40% occupied) and great music. 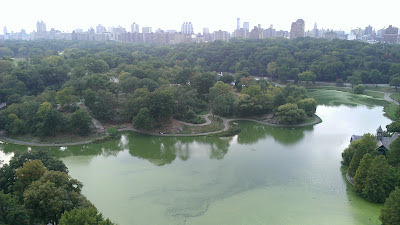 Like a lush Persian rug being unrolled before your eyes, the great green expanse of Frederick Law Olmsted's masterpiece, Central Park, and its hidden Lake, Harlem Meer, are majestically viewed from this unique vantage point . But on this evening it was the music that I came for and I was not disappointed. The Harlem Blues and Jazz Band is a now venerable institution. Originally founded in 1973 by King Oliver's trombonist /blues singer Clyde Bernhardt and the jazz aficionado Al Volmer, it is dedicated to keeping the significant side-men of the Classic Jazz period working and not forgotten. Since those early beginnings, an impressive number of musicians from the classic era have moved through this group's ranks, often until attrition forces the band to replace them. Through it all the band's authenticity to the music is retained while providing these journeymen musicians a reason to still play and giving the listeners an important link to the music's heritage. Predominantly a blues and swing era band, Vollmer is still managing the latest edition of the group. On this evening the band consisted of the trumpeter and singer Joey Morant , Fred Staton on tenor saxophone, Art Barron in the trombone chair and Fred Wurtzel, the guitarist. The rhythm section included pianist Reynold "Zeke" Mullins, bassist Michael Max Fleming and drummer Jackie Williams. All veterans of an era gone by, Fred Staton logged in as the elder statesman at ninety-seven and still going strong. 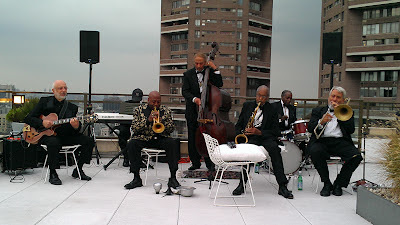 The group exhibited grace and vitality as it went through a repertoire that included Ellington standards like "Take the A Train" , "In a Mellow Tone" and "C Jam Blues." Trumpet player and de facto master of ceremonies Joey Morant, sang the Armstrong classics "What a Wonderful World" and "When the Saints Go Marching In" , punctuating the music with poignant trumpet solos complete with plunger mute in the tradition of Ellington mainstay "Cootie" Williams. Art Barron, who was a one time member of the Ellington Orchestra, did a fine job resurrecting the spirit of Ellington trombonist "Tricky" Sam Nanton, as he slurred and muted his instrument to create a plethora of unusual sounds. He would often team up with tenorist Fred Staton in a tag team of call and response. 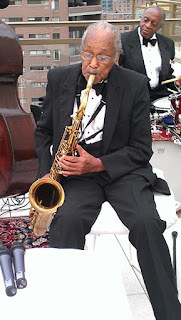 Staton's hushed tenor sound was smokey and warm; somewhere between Lester Young and Ben Webster. Staton is the brother of the late singer Dakota Staton and has played with Earl Hines among others. Reynold "Zeke" Mullins was holding down the piano duties on the electric keyboards. You could barely see his eyes under his NY Yankees cap. Mullins was a frequent collaborator with the great Lionel Hampton's band. The stately Michael Max Fleming, whose tall lean appearance was the human embodiment of his instrument the upright bass, stabilized the bottom and kept the groove on track. Fleming made his bones playing with childhood friend and multi-reed player Rahsaan Roland Kirk as well as Eddie "Cleanhead" Vincent and backed up the singer Sammy Davis Jr. The drummer Jackie Williams kept impeccable time on the traps. Williams has anchored groups with Milt Hinton, Buddy Tate and Illinois Jacquet to name just a few.Guitarist Ed Wurtzel was heard on his hollow bodied guitar deftly comping behind the band and soloing with gusto especially on "C Jam Blues." 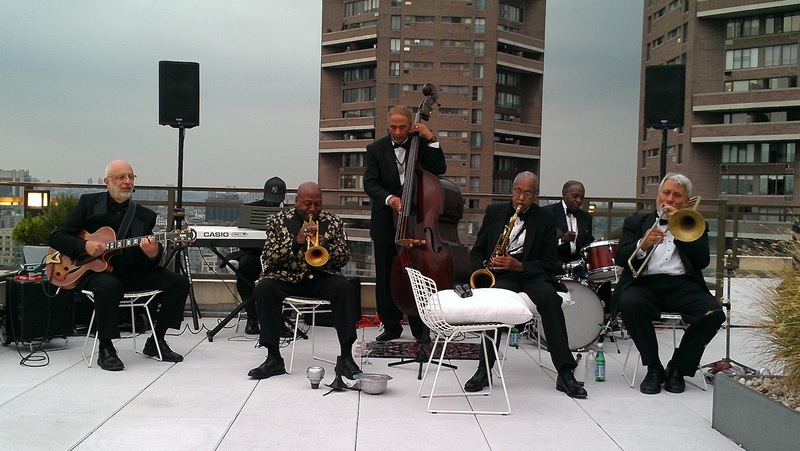 With showmanship and joy that belies their age, the Harlem Blues and Jazz Band is a living tribute to classic jazz from the swing era and a treasure to anyone who appreciates the fine tradition they are keeping alive. As a working band that has done tours all over the United States, Europe and Scandinavia this group shows no signs of letting age get in the way of their love of this music. Catch them if you can.